Oh heyyy Prim and Propah readers! I'm Amy from Creative Soul Spectrum! After last year's DIY infinity scarf post, I'm so happy to be back here guest posting again! I know how much you guys love a good DIY project, so I've got another one for you today. This one involves my favorite thing: gold spray paint. Seriously, once I purchase a can of gold spray paint, nothing in my house is safe. This time, pine cones were on the receiving end of my obsession. 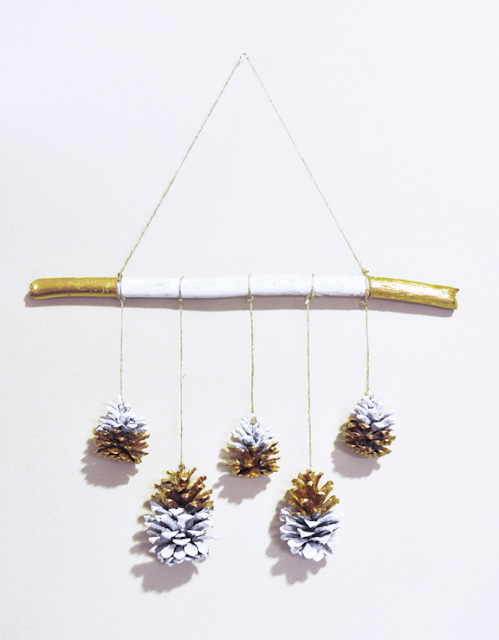 I wanted to make a holiday decoration that was a little out of the ordinary, so along with the gold spray paint and pine cones, I used twine, white spray point, frog tape, and a branch to make a pinecone mobile. Instead of hunting down 5 perfect pine cones, I opted to buy the scented ones from Michael's instead. The branch, however, came right from my backyard. Woo nature! So first things first: spray paint everything white. 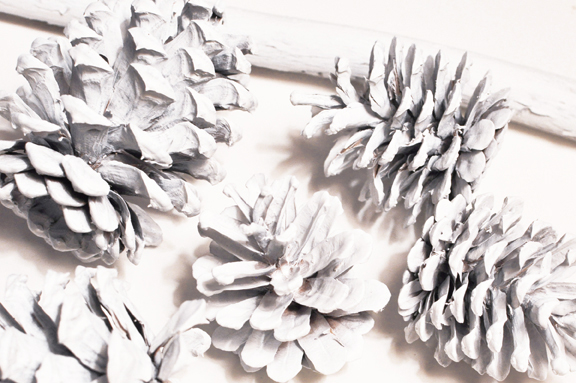 This is going to take a little bit of time since the pine cones have a lot of nooks and crannies, and you'll need to apply a few coats of paint to make sure they're all covered. 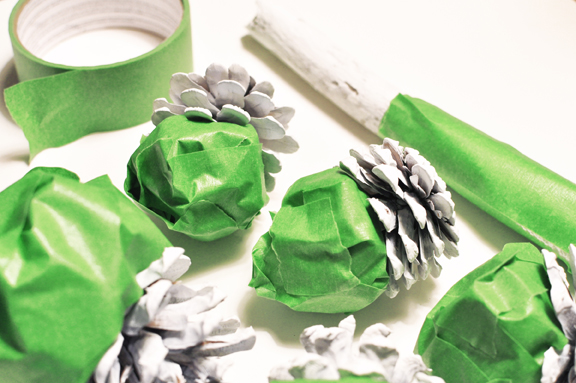 Once the white spray paint is completely dried, use frog tape to cover the areas of your pine cones and branch that you'll want to be gold. 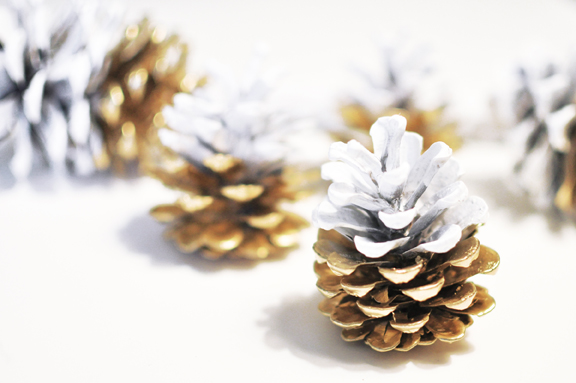 I chose to keep the tops of the small pine cones white, and make the tops of the bigger pine cones gold. Now, apply a couple of coats of gold spray paint (I used Krylon metallic gold). 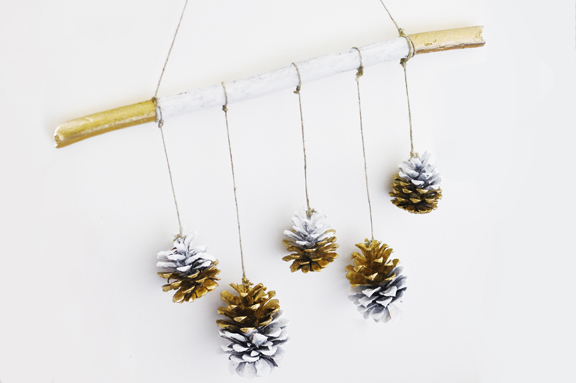 Your pinecones should be looking pretty fancy now! 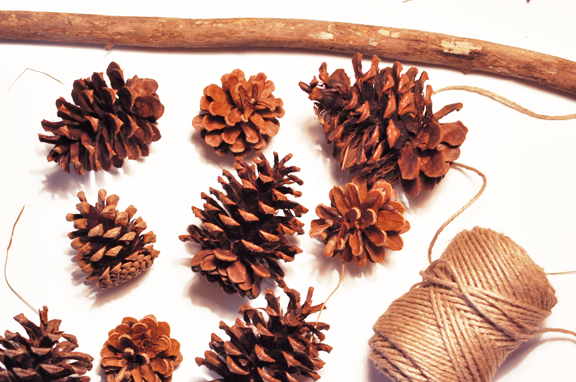 When everything is completely dry, tie the pine cones to your branch using twine. Then tie a piece of twine to the branch so that you can hang it up. And now you're done! Doesn't everything look better with a little bit of gold? Thanks for letting me stop by, friends. Happy Holidays! You can catch all of Amy's awesome posts on her blog and to you can catch her on Twitter, Facebook and Pinterest! Be sure to check out today's giveaway from Giant Vintage Sunglasses! I love this DIY, so cute! I know, it's adorable and so easy!